An early New Year's Eve dinner after work at the Cactus Club: Rainforest Greens, not unlike Milestones's Spring Mix Salad, but much, much better. And a late late extremely bad New Year's Eve choice of congee at a Chinese restaurant. It was my plan to do leftovers tonight but shortly after 1 o'clock this morning my neighbour and I ate the rest of the curry. So I decided to try these "low-carb" zucchini noodles from Recipe Zaar. Grate zucchini into long strands. Add olive oil and salt and pepper to taste. Let the bowl sit out for 1 hour to temper the noodles, tossing once or twice. Because they are so thin, the noodles don't require cooking. Note: I wasn't able to use the whole zucchinis because I kept accidentally grating my fingers as I got toward the middle... so I chopped up the rest and put them aside for some future meal (and/or to rot in my refrigerator). The vermicelli was OK... a lot lighter than pasta, but I'm not convinced that tomato sauce is the right companion. It might go better with pesto and/or as part of a pasta salad recipe. The meatballs were adapted from Julie Van Rosendaal's meatloaf recipe in Starting Out. I changed it to use cilantro because I didn't have any parsley... I love cilantro, but in retrospect, it's probably not the best choice for a meatball accent. But overall the meatballs are good, though they taste perhaps a little too much like saltines. You can use bread crumbs or quick oats instead. 1. Heat the oil in a skillet over medium heat and sauté the onions and garlic for about 5 minutes, until the onion is translucent. Set aside to cool slightly. 2. In a large bowl, combine the meat, sautéed onion and garlic, crushed crackers, yogurt, tomato sauce, egg, cilantro, Parmesan cheese, Worcestershire sauce and salt and pepper. Mix everything together with your hands until it's well blended. Shape into walnut-sized balls. 3. Cook as many as you like in a skillet with a little olive oil, rolling them around until they brown on all sides. Pour spaghetti sauce over the meatballs, and simmer them in the sauce until they've cooked through (If cooking without sauce, they should take about 15 minutes). Raw meatballs can be frozen on a cookie sheet, then transferred to freezer bags to store for up to 4 months. Cook as directed straight from the freezer -- there's no need to thaw them first. Tomato Basil soup. Spring mix salad. As promised, tonight I cooked from Atul Kochhar's Indian Essence. I had all the spices needed for this curry in the India Pantry in a Box except for onion seeds, so since I still had some onion-related chives in the fridge, I threw those in instead. If you're going for authenticity, omit the chives and add 1 tsp onion seeds along with the cloves, cardamom, etc. 1. Cut the potatoes into wedges. Cut the cauliflower into small florets. Heat the oil in a sauté pan and lightly fry the potato wedges and cauliflower, turning, for 3–5 minutes. Remove and set aside. 2. Add the cloves, cardamom pods, cinnamon and bay leaf to the oil remaining in the pan, and sauté for a minute or two until the spices crackle. 3. Return the potatoes and cauliflower to the pan and add the turmeric, chili powder, salt and sugar. Mix well and add 1 1/4 cups water. Bring to a boil, lower the heat, and simmer for about 20 minutes until the potatoes are just cooked. 4. Add the chives, tomatoes and yogurt, bring to a simmer, and cook for 5 minutes. Add the chopped cilantro and sprinkle with garam masala to serve. I bought all the ingredients for my exciting first-ever authentic Indian curry! Except, I ate at Earls. Baby Calamari and Grilled Prawn Tacos. For dessert: Lost Highway and Truffle Kisses. My Lynchian holiday education included a late-night viewing of The Elephant Man last night, and continued this evening with Mulholland Drive, accompanied by the last of the leftover stuffed peppers, and some Ben & Jerry's Cheesecake Brownie ice cream. In fact I watched Mulholland Drive for the second time this morning, and following an afternoon of reading about it here and here, decided to make it a Mulholland Drive day and watch it one more time... If you've seen the movie just once before you'll know what it's like to almost get what's going on, but fall just short of that one little connecting idea that will piece it all together. Anyway there are about a million such ideas here. 1. Pay particular attention in the beginning of the film: at least two clues are revealed before the credits. 4. An accident is a terrible event... notice the location of the accident. So, my Christmas dinner was Vietnamese salad rolls at the Tinseltown food court. Followed by the newest addition to the holiday movie roster, Four Christmases. And, it's over! Christmas is done. Yay. One of the photographers I work with gave me this India Pantry in a Box from South China Seas Trading Co for Christmas, which I'm pretty excited about; we put out two Indian cookbooks this past year, which were delicious to photograph, but which I was not likely to be cooking from because of all the spices required... But now I have them all at my disposal! Unfortunately I don't have the books at home with me over the holidays, but I do have this old Whitecap book Indian Essence, by Atul Kochhar. I'll see what I can come up with in the next few days. For dinner I had leftover stuffed peppers; started off with some Love Actually, and then tempered the Christmas spirit David Lynch-style with a little Inland Empire. Plenty of Baileys to set the tone, and some wasabi peas to offset it. And then I baked cookies. I've eaten these Chocolavas several times; it's a favourite recipe among the girls at the office, from Julie Van Rosendaal's One Smart Cookie. It was my first time trying it myself, but the recipe's so simple it's impossible to screw it up. Unless you decide to satisfy your curiosity about whether or not one can use waxed paper to line a cookie sheet instead of greasing it, and then almost set the apartment on fire. 2. In a large bowl, combine flour, sugar, brown sugar, cocoa, baking powder and salt. Stir in margarine until the mixture is well combined and crumbly. Add egg whites and vanilla and stir by hand just until the dough comes together. 3. Place a few heaping spoonfuls of icing sugar into a shallow dish. Roll dough into 1 1/2" balls and roll the balls in icing sugar to coat. Place 2" apart on a greased cookie sheet. Bake for ten minutes, until just set around the edges but still soft in the middle. Transfer to a wire rack to cool. err... pâté, rather. A Freybe fine liver sausage sandwich, to be exact. Later: polenta fries with curry mayo stolen from Taryn at The Cascade Room. Lunch was pretty much my dinner, as it left me fairly incapacitated for the rest of the day. I started drinking at one in the afternoon at our office Christmas party and kept it going for the next eleven hours, never really attaining any kind of intoxication but at least maintaining a false sense of warmth to carry me through the bitter bitter cold. The Christmas party was at [a Greek restaurant] on Lonsdale in North Van. I was already full after the charbroiled calamari appetizer. There were pitas with hoummos and tzatziki, and then there was moussaka and greek salad and potato. A trail of barhopping with coworkers afterward finally led me to dessert at Zocalo on Main Street: some kind of hot Mexican chili-chocolate brownie with cinnamon ice cream. Ahi Tuna Tartar at the Crime Lab. I slept all evening, then ate a red pepper and put a dent in the leftover chicken. Even though I didn't 'cook' yesterday, I did prepare a marinade for tonight's homemade chicken wings. I tried the recipe given to me at the Barbecue Secrets Deluxe! shoot... except I had no idea what measurements to use... I ended up guessing 1/8 cup sesame oil, 1/4 cup soy sauce, a few cloves of garlic and about the same amount of fresh chopped ginger. The result: too much oil; not enough ginger. I followed the cooking instructions from Julie's drumsticks for the wings. I meant to cut off all the fat, because as it turned out last time, chicken fat was a lot less exciting than I expected, but I was sick and did not have the patience to remove it. All of this chicken-making was in vain, because then Hughie called me for round 2 at Zakkushi on Denman. Various grilled meats abounded again: more melt-in-your-mouth deep-fried chicken skin, some bacon-wrapped quail's eggs, gomae and yaki udon and some kind of cheese-covered molten rice skewer thing. Topped off with green tea-dusted ice cream with red bean pancakes and chocolate-covered banana gyozas, and two bottles of saké. Whew! It was as intense as it sounds. Dinner with my best friend the old standby, President's Choice chicken & red pepper stone-baked pizza. Also some of these grape tomatoes, for added non-carbness. Where does lunch end and dinner begin? Especially when you didn't really eat breakfast. Hmmm? Today I ate a pulled pork sandwich around dinnertime. Later I had dinner, ...after dinnertime. It was, yet again, honey garlic chicken wings from Checkers. I only really mention the pulled pork sandwich because it was infinitely more exciting than the wings. Also, there was this "Bayside Special" coffee. It was the kind of day that makes you proud to be a carnivore. Today was the final shoot for Barbecue Secrets Deluxe! It's been a pleasure to work with such talented people, and the BBQ has been without a doubt the best I've ever tasted. Today consisted of Grilled Oysters with Orange Walnut Vinaigrette, BBQ Chicken (note to self to try this easy marinade in the future: soy sauce, sesame oil, fresh ginger and garlic), Pepper-Grilled Tuna with Wasabi Mayo, Grilled Rice Cakes, Tuscan Grilled Game Hen (those flying angels pictured above) and Grilled Trout with oranges and onions. Leftovers tonight, followed by an assortment of crudités at the Xtra West Christmas party. We ate this much. With a creamy sauce that may or may not have been "ranch." O Holidays! I couldn't think of a better time to immerse myself in the works of David Lynch. I stocked up on some of his movies this week and they have become my dinnertime entertainment. I am really glad I wasn't eating chicken during the scene in Eraserhead where Mary's father asks Henry to carve the meal. It is quite clear from the last several posts that I need more vegetables in my life. But I don't really have the mental capacity this week to do any kind of cooking, so I chopped up some green peppers and mixed them in with tomato sauce and whole wheat rotini and sat back and watched a young Pete-from-Twin-Peaks's head turn into eraser shavings. I've been too busy to do groceries, so wound up raiding the preserves props tonight for something to eat. "Salsa Fiesta!" with nachos. Hooray. It was another day spent alternately photographing and eating preserves. There was kiwi jam, applesauce, raspberry and strawberry rhubarb jam, and yogurt with black & blue jam, but nothing approached the pure deliciousness of this plum butter, spread on pecan fruit bread from Capers. Honey Garlic Chicken Wings at Checkers. There wasn't really a "dinner" per se, tonight. Just two leftover drumsticks, a tiny piece of cake (with homemade fondant) and some of Hoko's yam tempuras stolen from Liv and Jackie. The cake, made by Darcie Omori, was in celebration of Discorder's 25th anniversary; Discorder, for which I've been a contributor since (gasp) 2001. Discorder cake photo by Duncan McHugh. A sandwich with roasted red pepper dip, goat cheese, prosciutto, and zucchini relish left over from this week's photo shoot. Tonight's recipe comes from Julie Van Rosendaal, whose "reality cookbook" was the inspiration for this blog. Dinner with Julie is not only a kitchen diary of daily meals, but a handy archive of delicious recipes with useful tips for leftovers. I felt safe in her hands for my second foray into cooking chicken: Spicy, Sticky Drumsticks. You can find the marinade recipe here. I went with dark maple syrup and balsamic vinegar, and made sure not to trim any of the fat or skin. As for the fearsome chicken-cooking, I broiled the drumsticks over the course of 20 minutes, taking them out twice to add more marinade and turn them over. Success! Quick, easy success. Served with roasted veggies. I was tempted to try the Roasted Chick Peas with Garlic and Chard as a side, but let's get real. The fact that I cooked at all is good enough for now. Today is Day 337 of Julie's year in her kitchen. I've been an avid reader of the blog, and the internet will lose a bit of its lustre when it comes to an end in January. 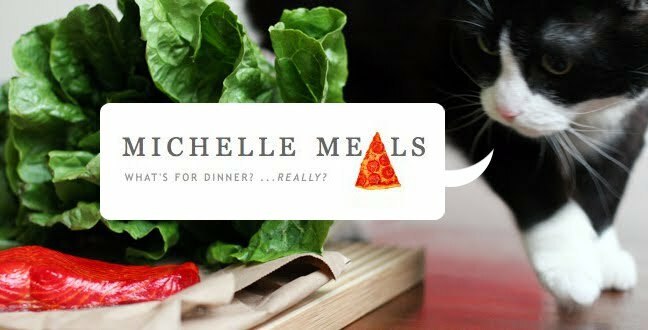 Never fear though, Michelle-Meals will still be going strong. Today I basically ate almost an entire sourdough baguette, with cream cheese and Urban Fare Chunky Red Chili Pepper Spread, for both lunch and dinner. In other food-related news, Peanut is currently trying to bite the band-aid off of my thumb, which I nearly severed while slicing said baguette.